I learned to applique by watching video’s made by Becky Goldsmith of Piece O Cake Designs and POCD are still at the top of my list of designers. I would be thrilled to win this book! Kay I have searched for this book everywhere. I would so love to win! I’m an avid bird watcher so this pattern really appeals to me. I love the Piece O Cake gals too as well as an avid bird watcher! Thanks for the giveaway! Great birds! Would love to win the book to make a little quilt for my mother-in-law. Oh, this is darling. I would love to make this design. What wonderful blocks and so unique. 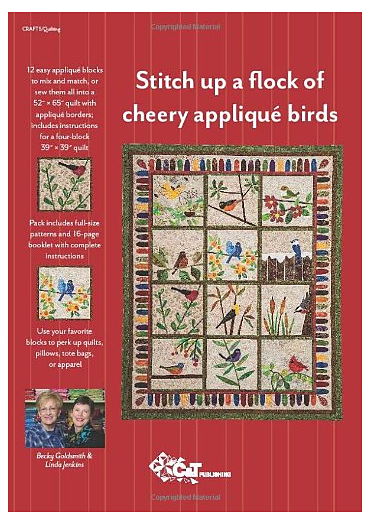 I love needle turn applique and birds. I think Becky Goldsmith is a wonderful designer. I would be so excited to win this book. I do enjoy their videos, they are easy to follow and understand. The new pattern is so fun, have had my eyes on it. Love how you can use them as single blocks for small quilts or pillows or make it into a larger quilt. Love those birds…count me in. I love feeding and watching wild birds. This is a lovely pattern. Thank you so much for sharing with us. Love those birds! Thanks for the contest. This is the perfect little project for summer time. I would really, really love to win this pattern. I also love Piece O Cake patterns..
Hi! Looks like fun! I am in Canada but if am lucky enough to win, it can be sent to a friend in the US. Thanks! I love birds! POC designs are always so lively. thanks for the chance to win! The pattern is wonderful and brings fabric and nature together beautifully. I would welcome the opportunity to create this one! These ladies never fail to come through with great designs. Thanks for the review. I love Piece O Cake designs so much. These birds are absolutely adorable. I would love this book. Thanks for the chance to win. Would love to have this as I love birds. Thanks for the chance of obtaining this. What possibilities this book can have. Can only imagine beautiful quilts. Thank you for the opportunity to win. I also love the colors that Becky and Linda use for these happy applique quilts. If I don’t win I’ll buy this book. Love it!!! I’d love to win this book. I learned to applique using their books and videos. I’ve always been a fan of Becky and Linda’s work. Would love to win this pattern set! Their pieced backgrounds, and bright prints are so fresh and pretty. I love the larger scale prints they’ve used. Thanks for the chance to win. My fingers are crossed tightly that I might win this wonderful book. Having gone through some very ill days recently I spend hours on my front porch watching watching the little beauties at my feeders and want the opportunity to recreate them for inside my house as well for the days to come when they migrate South again! My daughter and I are bird watchers! How lovely! thank you for the giveaway! I love the way they use pieced backgrounds and bright colors. I’ve loved POC designs ever since I took a class from Becky at my LQS. Such a personable and gifted lady! I’ve used their pieced background technique in a couple of other designers’ quilts as well. Love these blocks! I would make a quilt and matching pillow shams for my guest room. Hope I win. I love this pattern booklet. The pieced background is awesome. Happy Fourth! 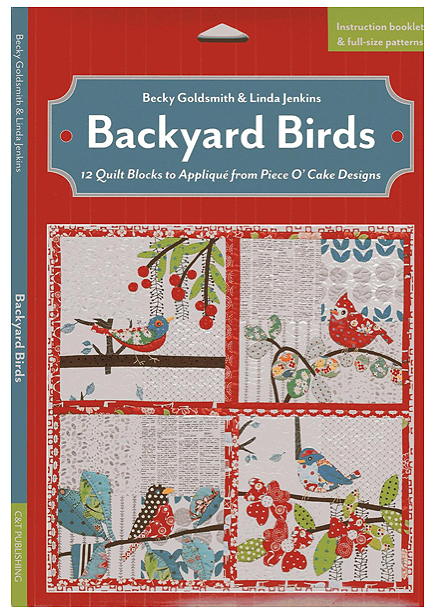 I would love to win Backyard Birds patterns. Thank you for the chance to win. Hand applique is my first love so this is right up my alley. Love the birds, too! Thanks for the giveaway!! would love to meet a copy of this book! I love these ladies as well and there Birds… Thank you for the opportunity! Winning a copy of this book would be fabulous. Love the designs. I have others by these ladies…they are wonderful! What fun!! Love the pieced backgrounds! What a cheerful, happy quilt! Thanks for the opportunity to win this pattern. I love this pattern! And I really appreciate that they give us full size patterns to work with. If I don’t win then I will buy this!